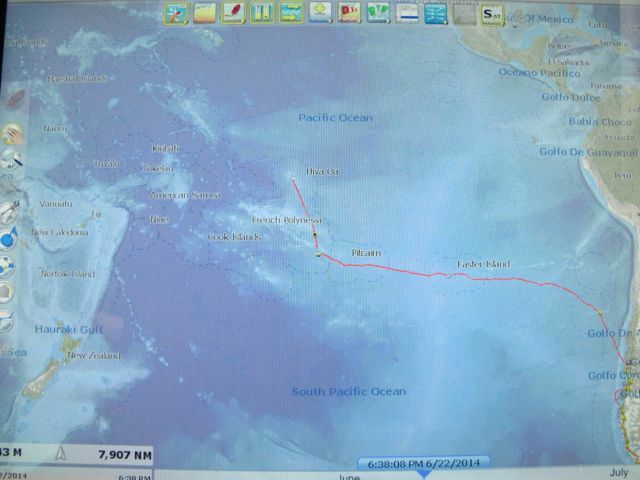 Leg 7 – The Pacific Crossing. After a six week layover in Chile it was time to move on. We left Puerto Montt on Tuesday 13th May. The day was another typical grey Chilean day minus the rain which was good especially to enjoy the last of the Patagonian views whilst we navigated the 60 miles of channels out to the open water. We were greeted by 6 knots of following current and a fierce short steep sea at the exit of the channel just before dusk, and there we were according to the charts officially in the Pacific Ocean. This has been the trip we have both been waiting on for years. The Pacific has been a dream for me after meeting Morgan and hearing of his travels. Excitement filled the air and the boat as we started on our way. The first night at sea was a motoring one that gave everyone the opportunity to get their sea legs back. The days to follow was a combination of light winds and on the third night prior to our arrival at our first destination we were pushed along by a 30 knot wind and following sea. Louise was put through her paces as the miles clicked by. The temperature slowly started to improve on a daily basis. The nights were cool and fresh and although we all still wore our full foul weather gear it was no where near the cold we had experience months before. The full moon lit up the ocean when not covered by intermitted clouds. During the day we were accompanied by an abundance of sea birds. 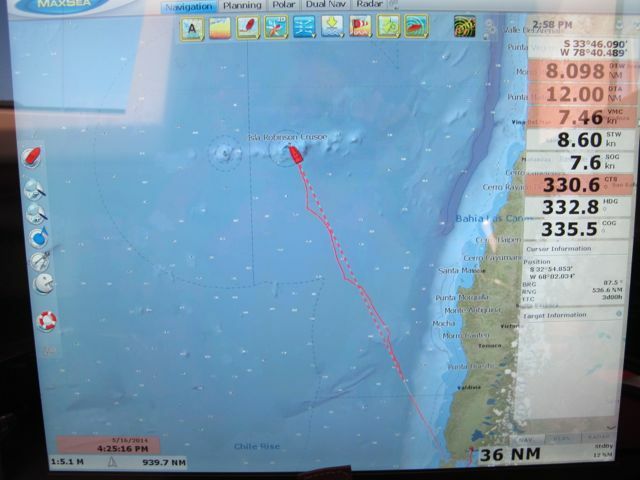 At 12:30 on Friday 16th May three days after our trip started land was sighted. As the sunny afternoon progressed the outline of the Juan Fernandez Archipelago came into view and the true sense of leaving the mainland and heading back to where Islands only existed became a reality. The Juan Fernandez Archipelago is made up of three islands and numerous rocky islets. Isla Robinson Crusoe is the archipelago’s only permanently inhabited Island at 22km by 7km its peaks were visible from 30 miles off shore. In 1709 the island was bought to the public attention when Scottish seaman Alexander Selkirk was rescued from its shores after being stranded there for over four years. This story was used as the basis for ‘The Adventures of Robinson Crusoe’. 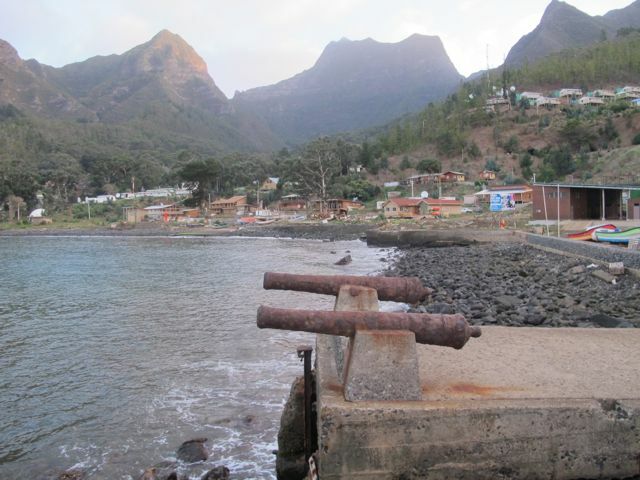 San Juan Bautista is the Islands only settlement nestled by the shores of Bahia Cumberland at the foot of the green mountains. With a population of approximately one thousand people life ashore is simple. Dirt streets lined with new wooden houses and buildings. The Archipelago was hit by the 2010 Tsunami that destroyed a lot of the coastal homes and business’s and killed 16 people, therefore it was still in the rebuilding stage. The locals are super friendly and welcoming, stopping you on the street just for a chat. We were invited to a local home for an open fire cookout which consisted of grilled goat. It was absolutely delicious and a wonderful experience. 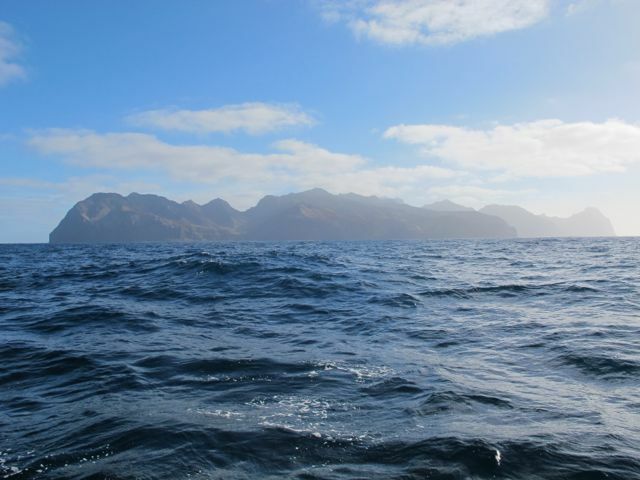 The Juan Fernandez Archipelago claims to have ‘one of the worlds most precarious ecosystems’. We stayed less than two days on the Island before continuing on our way on Sunday 18th May. With a good weather forecast and a following sea for the next few days progress was good, 200 mile days were an easy task. One of the things we all noticed during those first few days were the lack of wildlife. No birds, no dolphins or whales and no fish. It was like the ocean was empty and no form of life existed but us. The moon was making its appearance later and later so the early evenings were dark. The first few nights were testing as squally weather at night meant the winds were often fluky. As we headed further west the temperature slowly continue to rise. On the odd clear night the sky would be lit up like diamonds on black velvet. By day 8 we could all feel a difference in the temperature and a layer of clothing was finally packed away. Whilst motoring early in the morning just after dawn the forgotten fishing lines that had spent the night in the water started to sing. Mahi Mahi on…..our first official fish of the trip. Everyone jumped into action and it was a team effort to bring the long awaited fish in. Big smiles all around and fish for lunch and dinner it was. The wind started to pick up and our last twenty four hour run we were flying along. Early morning on day 9 the 27th May land could be sighted from over 40 miles of shore. The enchanted Easter Island laid ahead of us. 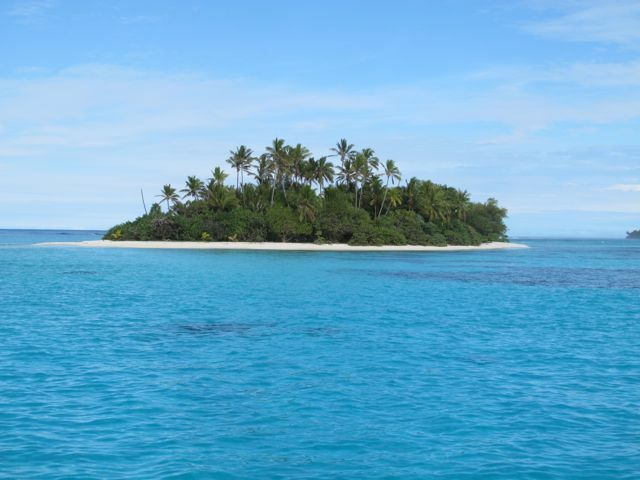 The triangular Island spanning just 23km at its longest was a welcoming sight. Two volcanoes could be seen in the dawn light. Making it look like two islands instead of one. 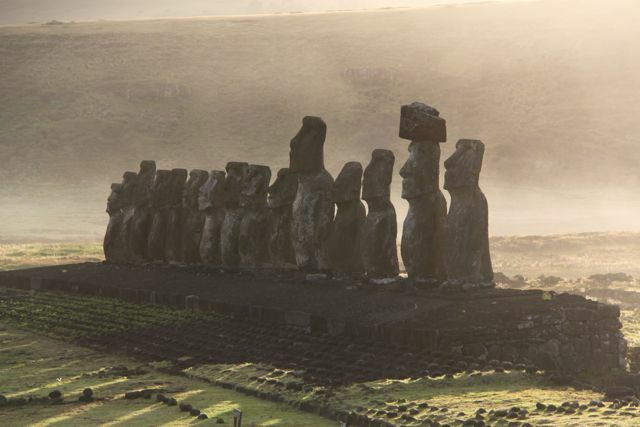 We sailed down the northern coast and spotted the first group of (Moai) giant statues from of shore. 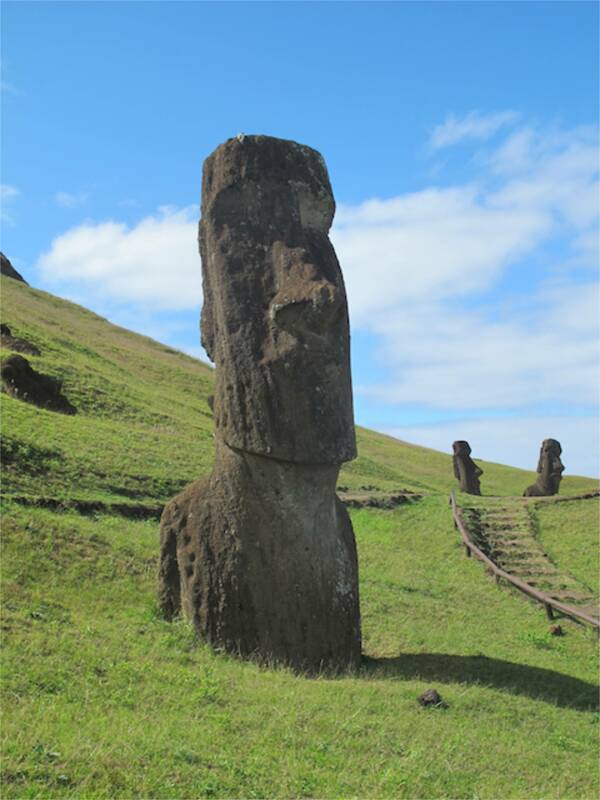 Easter Island is known famously for the impressive (Moai) giant statues numbering over four hundred that are scattered all over the Island and around its coast line. Just as many lies in the quarry in various stages of completion. The Moai range in height from 2 meters to an impressive 20 meters and could weigh anything from 20-30 tones. They were manually carved out of the quarry rock face and miraculously moved to their required location around the Island. How exactly is still a mystery. These statues represented important ancestors and were erected on the ancestral land of their kin groups. They were there to watch over and protect. The Island is referred to as one of the most remote places on earth, although I personally can argue against that. It is home to 5000 people, half are indigenous and half are immigrants from main land Chile. The entire population lives in Hanga Roa which is the Islands single settlement and most depend on tourism for their living. The main street is lined with supermarkets, shops, restaurants and tour agencies and at night the small town seems to come alive with tourist and locals alike. Foot ball is a very popular sport and we were fortunate to be present during one of their big matches. Although we didn’t actually watch the game, the opening ceremony with the traditionally Polynesian dancing was entertaining in itself. Inland the landscape is beautiful and varied. Extinct low lying volcanoes dotted each corner of the Island. There is a contrast of colors and vegetation and the coast line is rugged and fierce. It is the island where the mystically statues stands tall and where horses roam freely. After a good three days exploring the island and with a shifting wind which was bound to make the anchorage uncomfortable we headed on our way on Friday 30th May. It was a beautiful clear sunny day. With a light breeze from the north the Island soon slipped out of sight. The fishing lines went back into the water on our departure in hope of catching one of the Tuna’s that Easter Island is renowned to have an abundance of. With three big strikes and three big breaks of our lines, we knew they were there, it just wasn’t in the cards for us. It wasn’t until two days later just before sunset that the lines began to sing and a 20kg White Marlin was boarded much to everyones delight. 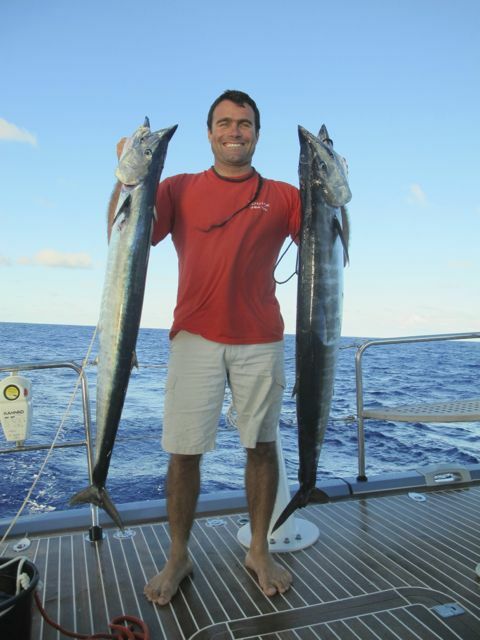 It didn’t stop there and the next day we caught two Wahoo’s and the following day two skipjack Tuna’s. It wasn’t our intention, but they came in twos the final two days. So although we were on the hunt for a yellow fin tuna we had to stop fishing, the freezer was overloaded and we were finally getting our full of fish in every way imaginable. The days were clearer and sunnier now with nights being a lot less overcast and menacing. The sky on a clear night was lit up with stars, the milky way could clearly be seen and made a spectacular sight. The first crest of the moon started to make its appearance and offered us the welcoming evening light. 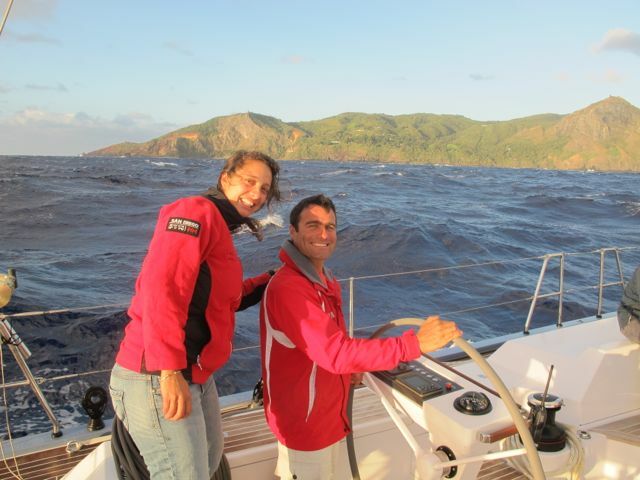 By day 3 of this leg we finally felt like we were back into the trade wind sailing. The sea was almost flat and the wind was constant at 15-20knots. It was beautiful sailing for a few days. However on the evening of night 5 that changed with a additional 15knots of wind bringing the wind speed up to 30+ knots and making the sea a white wall of water behind us that would often lift us up and have Louise pushed down a wave with such fierceness. We were being tossed about with the motion of the waves that seemed to be rolling in from every direction. With minimum sail area up we continued on a little less comfortable. Night 6 we continued on slowly. 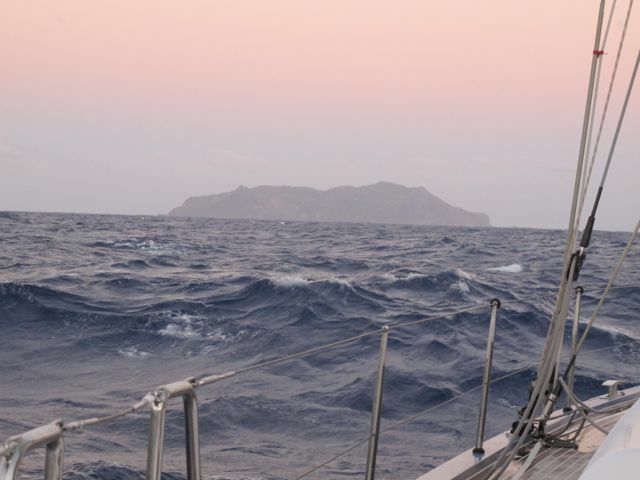 Our approach to Pitcairn Island was going to be in the middle of the night otherwise. Early hours on the morning of the 5th June with the black silhouette just miles in front of us we heaved to until dawn began to break on the horizon. As we approached the little Island in the morning sun excitement and anticipation grew. At only 2 miles long and a mile wide the small speckle of an island juts out in the blistering blue sea. Conditions around the Island was a little white with the breaking waves and 25+ knots winds battering the coast. Pitcairn Island is governed by New Zealand however it is a British dependency. It is famously known as the 50 or so inhabitants are mostly descendants of the mutineers of the Bounty and the small number of Polynesians that went into exile with them. We always knew going ashore on this little Island was going to be unlikely unless there was settled conditions, which there definitely wasn’t. The small harbor of the Island lies on the North Eastern coast and is only navigable by the locals. Unfortunately even anchoring of the main settlement was impossible, so we made our way to the western shore line and dropped the anchor in a sandy patch that had us rolling around and taking the strain under the gusting winds that barreled down from the clips. The Island was higher than I imagined, rising to 1000 feet with a golden exterior and lush green to the peaks. It reminded us so much of St Helena, just a much smaller version. After a few hours we were informed by the Islanders that the conditions were way to bad for them to send a boat out and it was likely to remain like that way for the next few days. Already knowing the forecast our fate of going ashore laid in their hands. 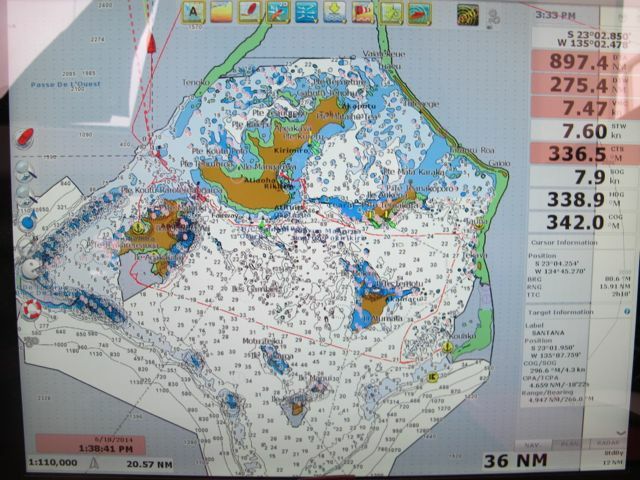 A few hours stop over on anchor to rest was all this stop could offer us. 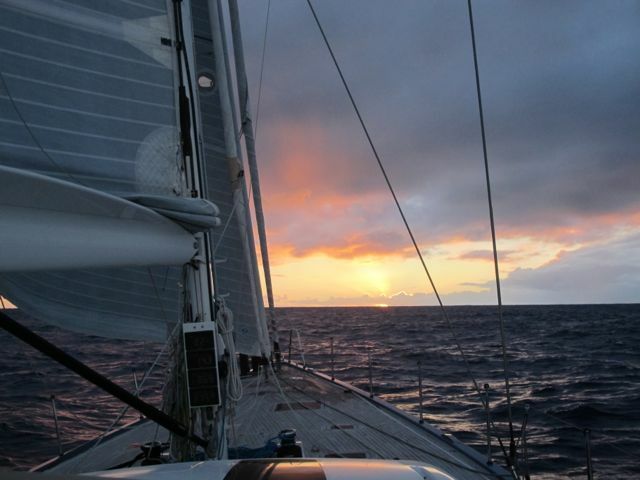 Just after 1am on the morning of the 6th June we picked up our anchor from Pitcairn Island, set the sails for the night and rolled our way North West. Conditions had dropped slightly however the down wind run wasn’t going to be the most comfortable. The night was beautiful and black with the milky way making an arch above us. Every star, planet and constellation above us twinkled down. We watched as the black silhouette behind us slowly started to disappear. The day came in early with a blue sky and warm sun. We had adjusted our times four times so far across the Pacific. With just over 300 miles to our next destination excitement grew. The last day and night at sea seemed to drag on as the milage counter slowed down. With the dropping wind strength and a straight down wind run it was a sloppy and noisy ride. At nine am on Saturday 7th June with less than 40 miles to go to our destination I eagerly searched the horizon and right there in front of us was the peaks of The Gambier Archipelago. French Polynesia was right there. Being one of the least developed Archipelago’s in French Polynesia, the Gambier’s is a truly heavenly place. Its unique formation of one continuous reef complete with palm fringe little islands encircles a small archipelago of lush mountainous Islands within the clear blue lagoon. There is five big Islands with additional rocky outcrops. Over looking the main town. The main anchorage is within a reefed area marked by unlit channel buoys of the biggest Island of Mangareva. We stayed anchored of the main town of Rikitea with the rest of the yachting fleet for a few days exploring the town and surrounding area before heading out to the reef itself. Ashore on Mangareva the dirt streets are super clean and everything seems in order. The locals are some of the friendliest we have met by far. An abundance of local grapefruit, papaya and banana’s were just given to us. A motu on the reef. Being anchored of a sandy palm fringe Island with the sight of the moon rising over the breaking reef was spectacular and what we have longed for. The Gambier’s is known for being one of French Polynesia’s biggest Pearl Farming locations. This was evident as the small farms were jutted everywhere around Mangareva and a watchful eye had to be given whilst navigating out towards the reef. 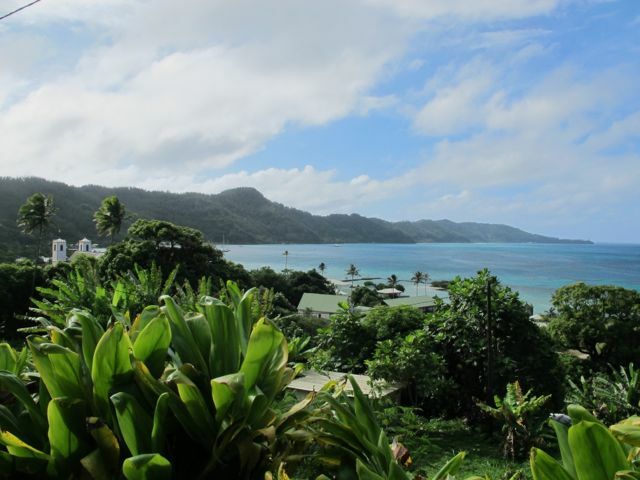 This archipelago offered everything you could ask for, sandy motu’s, lush mountainous terrain and a beautiful reef. It is by far one of the most special locations we have been to. It is a pearl in itself. Our route around the Gambier’s. After a 6 day stay it was time to leave. We exited the reef just after two pm on Friday 13th June. It was mentioned that we were continuing our journey and not starting a new one, so apparently leaving on such a date was fine….I crossed my fingers and prayed this to be true. Our start was a little slow, but the wind was due to pick up later in the evening. With a northerly point of sail and with the South Easterly trade winds kicking in we all hoped that this 900 mile passage would be a quick one. The night was glorious with Junes full moon. As we beam reached into the night the miles started to slip by. Saturday was a clear day with a beautiful blue sky. It felt like the last few days of overcast and grey was long behind us. Requiring replenishment of our fish stocks another Wahoo was hauled aboard early in the morning. 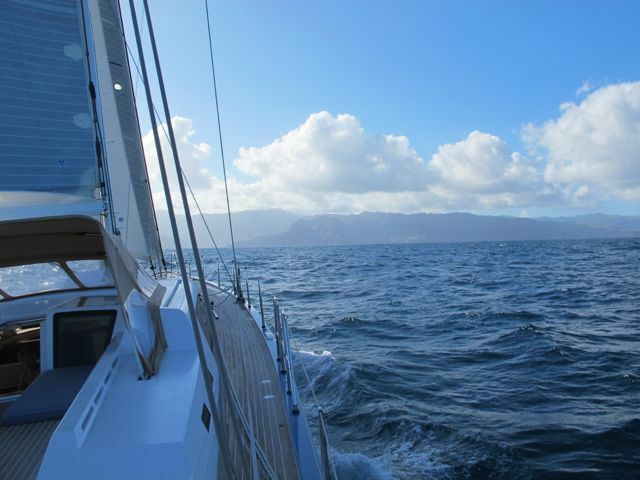 By the third night at sea the wind had piped up and an additional 10 knots of wind gave for a fast ride. Reaching 30 knots of true wind at times it was often a little nerve wrecking as we slipped down the waves doing speeds in the lower teens. By this point we were averaging a daily run of well over 225 miles. The heat was really starting to kick in, and nights were getting barmy and hot in our cabins. Monday 16th June, our fourth and last night at sea for a while. The wind had backed down to a more comfortable strength and the boat rocketed on. At the beginning of my watch the night sky was dark and full of stars. Just after 10pm the yellow glow of the moon made its appearance over the clouded horizon. As it ascended into the dark sky the yellow glow became the familiar shimmer of silver we had gotten use to the last few nights. Shining on our beam it lit up the night ahead. Early on Tuesday 17th June the much awaited Island Peaks came into view. Jutting out in the morning sun we sailed through identifying the Islands on our way north. With 5005 miles on the counter and exactly five weeks since our departure from Puerto Montt in Chile, the anchor was down at 4pm local time and after ten years of hearing about this magical place here we were finally in the Marquesas, Paradise on earth. Our route across the Pacific.